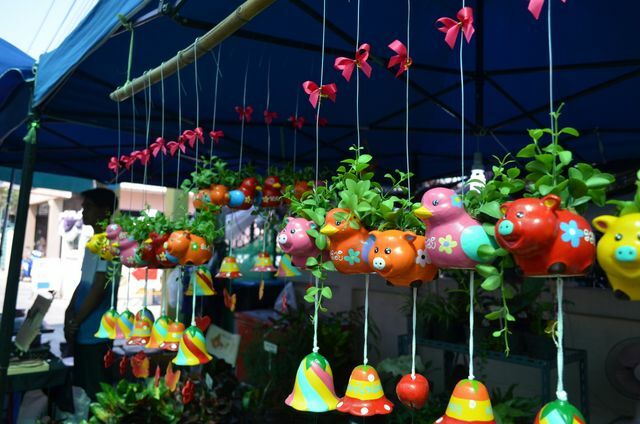 Bangkok‘s floating markets witness joyous family celebration as well as curious travelers’ footfall at large. 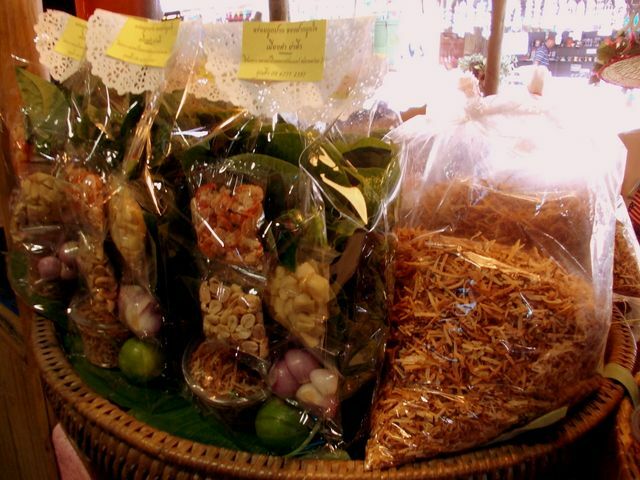 You will see vibrant happy families feasting together on weekends with signature Thai dishes. They eat different varieties of food in smaller portions and fresh ingredients and herbs feature high on their choices. 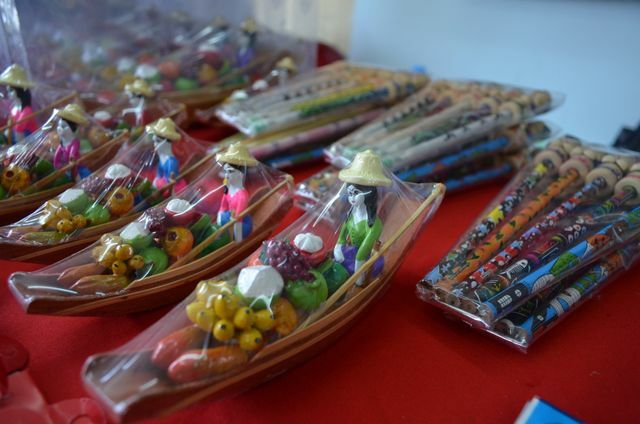 The floating markets are epitome of this waterborne civilization. Often situated on the tributaries of Chao Phraya river at Bangkok outskirts, floating markets are an ensemble of what a Thai fair looks like. “Skip today’s breakfast. We are heading towards the floating market” Sayantan told me on the first day. I was skeptical for valid reasons. Why will I do away with a Ramada breakfast for a village market? (Pardon me for I knew not about the great grand Thai feats back then). Nonetheless, we started for Khlong Lat Mayom (face palm for those who cannot pronounce it, just copy and Google it like I did). Followed by a boat ride, a metro rush and a Uber drive, we reached the market, far away from downtown. I will be honest with you. The pale out of fashion dresses hanging outside the market area, regular tourist souvenirs and lesser appearance of foreign people had killed my hopes. Hungry me became angry. Before I started bickering though, Sayantan found the way to enter the food stalls. Behold the affair! I swear when I was booking tickets for my second visit to “the land of free”, I could picture myself relishing the grilled prawns handed over from the boats. Unlike the otherwise touristy floating markets near Bangkok downtown, Khlong Lat Mayom oozes out an earthy charm. 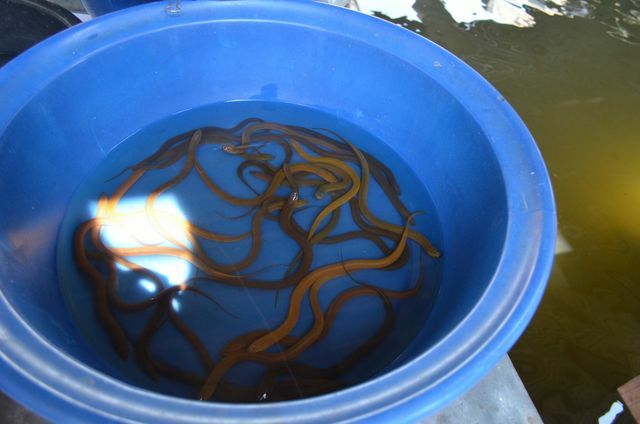 Locals flock here over the weekend with family to relish fresh produces. 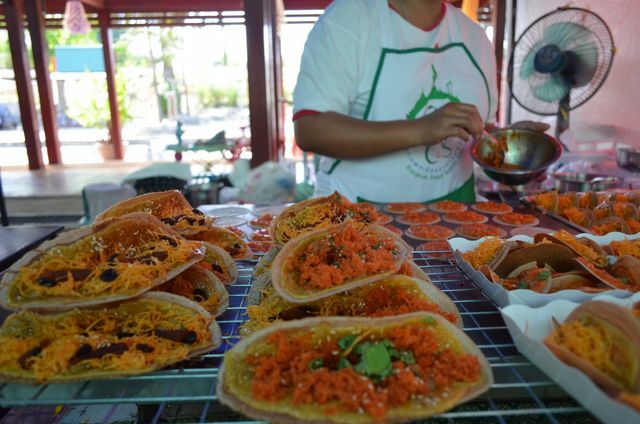 I remember as Jim, the Thai preparing inflated breads, said “we travel to eat food, we travel with family.” It was indeed a soothing sight to see families relishing a huge breakfast spread together. Food here is a serious affair. They eat plenty of dishes but all of them come in small portions. Variety and freshness effortlessly blends in a Thai platter. Once you have walked past the stalls with clothing and souvenirs (which I did not find remarkable) you will reach the insides of the market. It is based on the ground with a water body beside. Long tail boats and canals are synonymous here. We did not ride for we had a bus to catch for Pattaya and had to head back town after a quick lunch. But the boat ride seemed quite a leisurely experience. Yes, coming to the best part, how the quaint little market won my heart, I have to tell the tale of sumptuous food affairs. I was pleasantly surprised with the exotic food spread this market had on offer. I saw more than I ate and clicked in amazement. Of course it was my first time and bewilderment had the better of me. The lady on the boat was grilling prawns. if you ask for a plate, she will give you a box weighing a net’s catch. 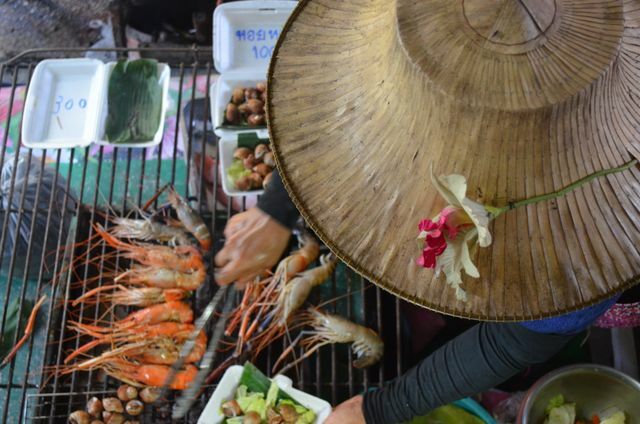 There are plenty, perfectly grilled prawns with heads and tails intact. The flavor, the aroma and the supple meat, all amazing things happened to me at one go. 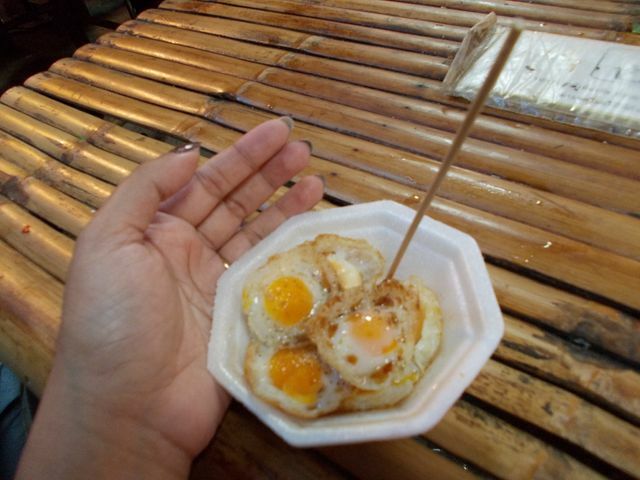 Though I found them later in Kerala, India, Quail’s eggs were the finest eggs I had tasted in Thailand for the first time. 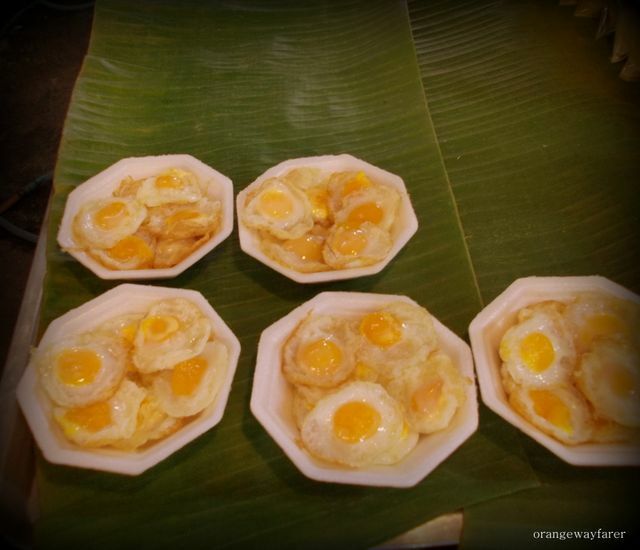 The small yolk melts in your mouth; they give you almost 10 or more eggs in one plate. Do try. 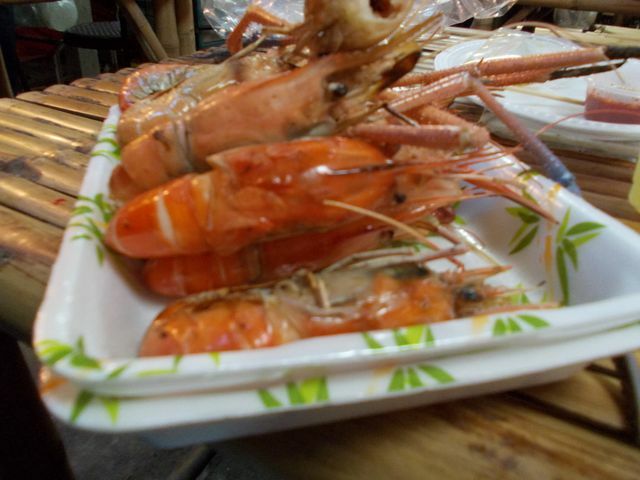 To confess the truth, I just had plenty of prawns and more of prawns and that satiated my hunger. Rest of the things, I will let the pictures speak the rest. The much awaited second visit happened after a hectic soused out night for us. We were four people this time. The other friend sadly had his bouts of nausea from soy sauce infused Thai sea food. “Is it always going to smell like this?”He had asked already entering a street food area! We wanted to visit a place that did not only serve authentic Thai but offered a bit of “globalised” platter as well. We chose Talin Chan, 12KM away from downtown Bangkok. Sure a metro station is nearby but we took a Uber, survived Siam rush hours and reached. Splendid flower decoration adorns the boulevard. You can buy some of these flowers in bouquet. 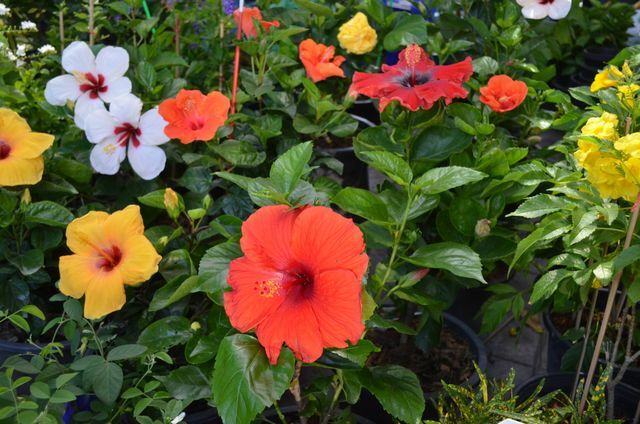 Should you wish to nurture a plant, choose from plenty? Colours galore here. Too bad we are foreigners and could not bring them back home. The hibiscus we use to worship daintily decorates the Thai households. Money plants abound! Choose your pick. 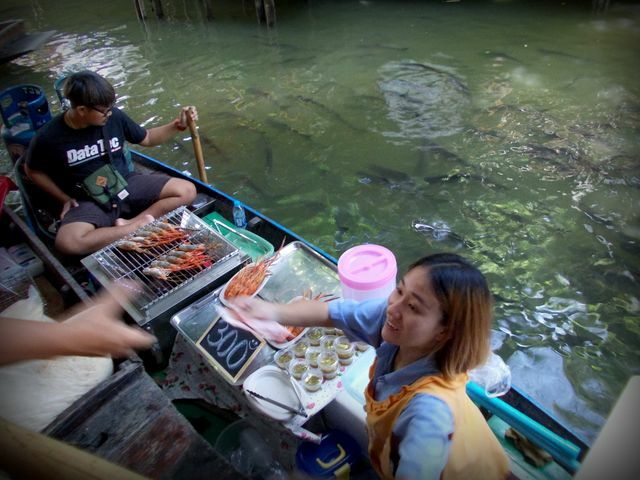 Unlike the previous one, this Floating market screams TOURISTY. Locals do visit but more number of travellers I could see. Generally there will be a price mark up. As usual the pleasant smiling Thai faces cordially invite you to try our exotic offering. The shopkeepers mostly come from villages nearby. At times, keeping up with English conversation could be a challenge. It is situated at the confluence of the water body, a rail line and highways. There are frequent boats peddling on the canal and will take you directly to Bangkok downtown within a few hours ride. We almost were about to board one ride however the tickets are to be booked beforehand and it surely is a time consuming affair. Us Indians surely love rivers but related activities (read boat rides) and more are daily affair back at home. We could let it go. Yes, coming to the topic of my carnal love, I would show you the “luncheon spree” I went into. 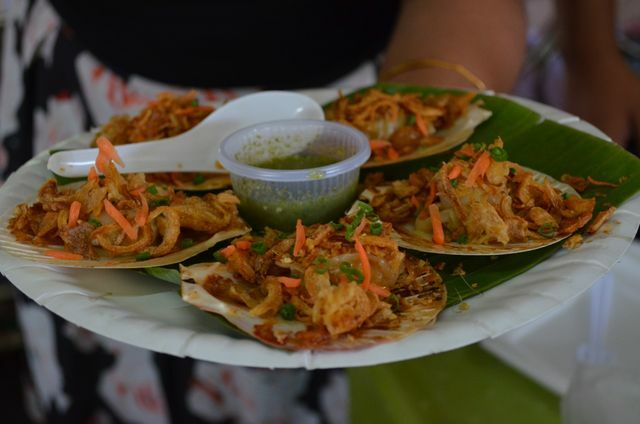 I recommend before you venture into any of dishes, check out the whole market first. Pretty often, the shops while entering will offer fancy portions and fill up the stomach and leave you to lament for the rest of the day for the gems of the market only reside on boats floating inside!!! 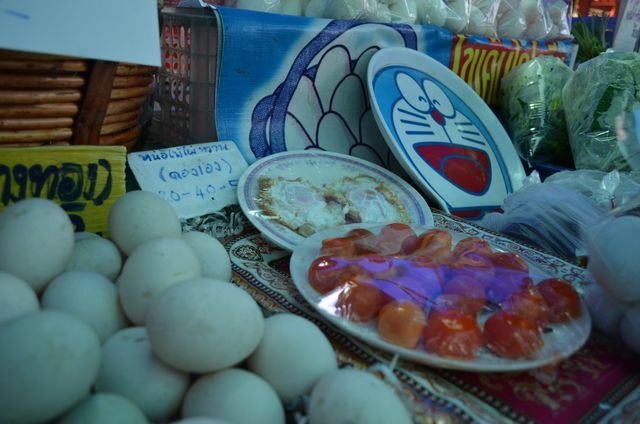 I tried the fermented duck eggs Thais savor. They take the orange egg yolk out and sale it. It was of grainy texture and void of obvious creaminess of rich yolk. The best of food, however was the grilled Oysters. I loved chewing on the fresh flesh melted seamlessly with dollop of butter. They serve 6 of them in a plate, topped with fried garlic; the aroma infused is ethereal and transports you to ninth cloud instantly. Make no mistake of my strong recommendation. 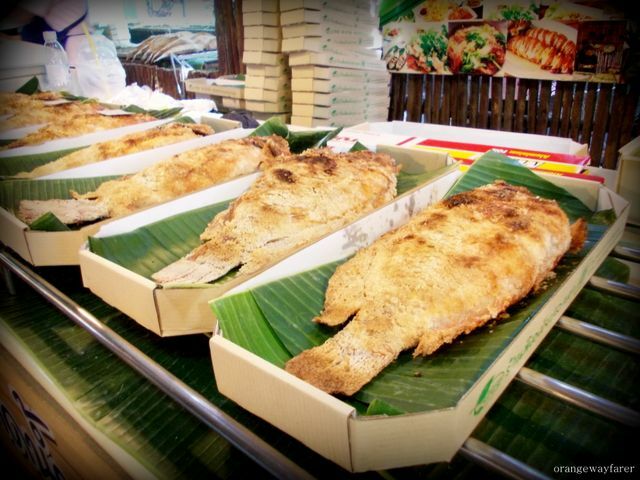 One signature Thai dish is grilling a whole fish to taste with least of spices. They serve the spice mix in the accompanying box. Soak in the mixture as you please. Snappers could be replaced with snakehead fish as well meanwhile huge carps float on the water surface to keep an eye for you. I felt quite an avant garde while eating the snails. 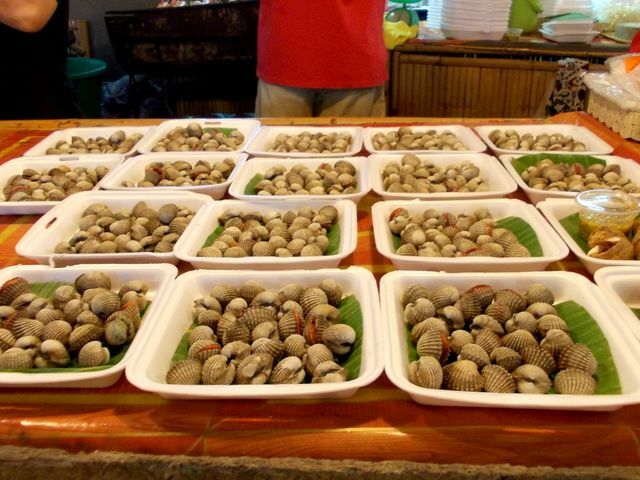 You need to take the flesh out from the hard shell with intricate twist of nails for they are served sans toothpick. 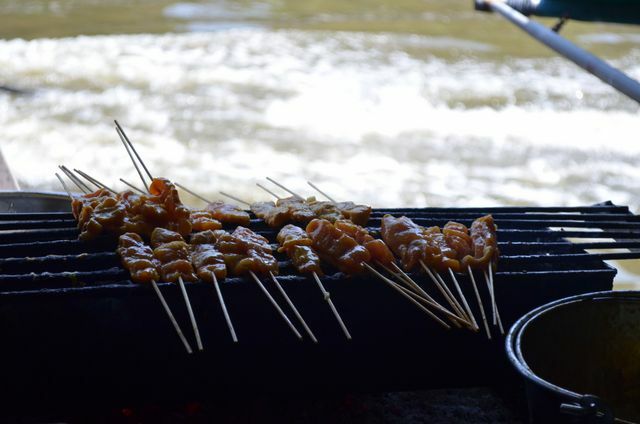 I relished it when grilled but loved it more when served in a soup or broth. 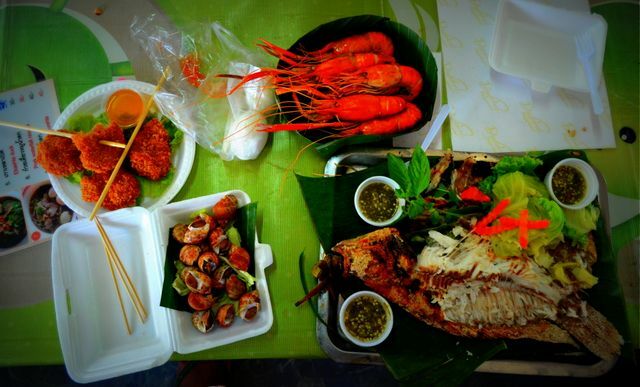 Of course my second visit to Thailand was mostly about eating grilled prawns. It is the quintessential fantasy I have cherished for long. The grilled prawns served from the boat lady are zenith of culinary craftsmanship in my opinion. Do indulge. On the pulpy water body, as the rails frequent now and then, the huge iron benches houses the market that vibrate even as a diesel boat pass by. As you eat, you might feel you are about to topple down, but you won’t. While retreating, I found a lady selling live snakes and turtles. To my bad, I could never make out her Thai and all my questions remain unanswered. Do they eat them? Pet them? Sell them? Do they bring good fortune? What was it all about? In my native place “mela” or fairs are affairs to socialise. The floating markets appeal to me with the quintessential Indian Mela flavour. 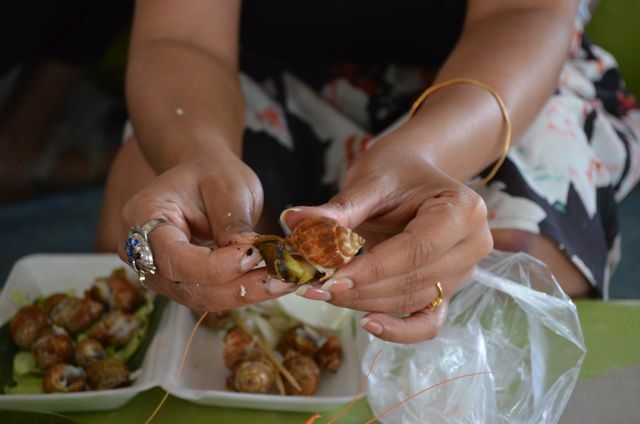 Only thing is, in Thailand, Thai prefer them every weekend whereas we await a festival soaked in religious faith. The Rath mela I grew up with happened during incessant rains of Bengal. The Jalebies and Kochooris never failed to disappoint though. However the floating markets of Bangkok’s are more like Eid celebration during Ramadan in India. The river flows unequivocally by the floating markets; no matter you reach there by a metro ride or by drive, for the river know it all. Metro rail is tube. In Kolkata, we call it metro. I love Bangkok’s China Town as well. 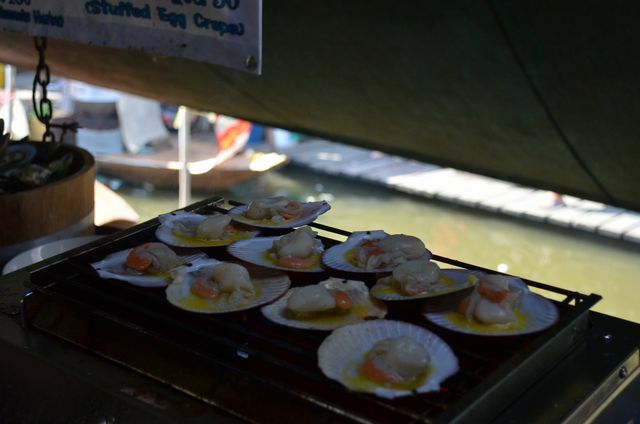 However the floating markets will enthrall your mind and taste buds on a different level. 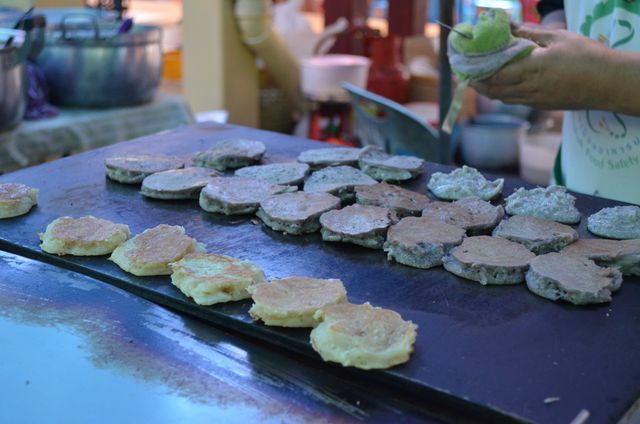 This is an authentic Thai and essentially a distinct part of Bangkok! 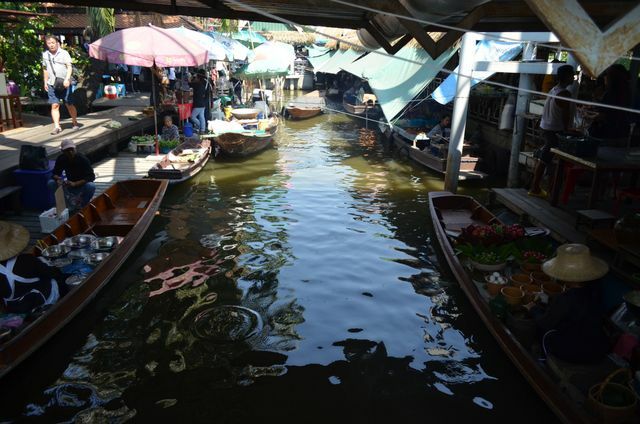 Floating markets of Bangkok is so famous, but we had to give it a miss because of lack of time . Nice pictures ? Hmm… I wonder what the snakes and turtles are for? The thought often comes in my head. What they were doing with them? Fried eggs among the food and your candid shots and of course Ankita z quirky iPhone cover my favourite clicks !! The Thai ambassador I shall call you !! Is anyone from tourism ministry reading this? Ms blogger fantastic spread of pictures waiting for the hamphi ,trip wonder what all you have to tell us excited and anticipating next blog ? 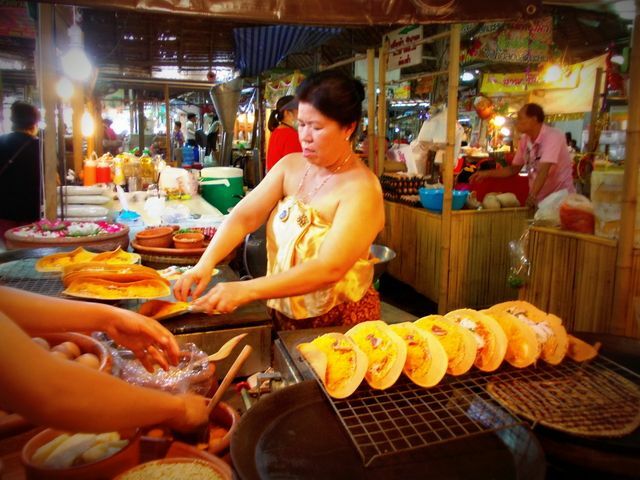 After reading this post, I think I will visit Thailand to eat and not for sightseeing! 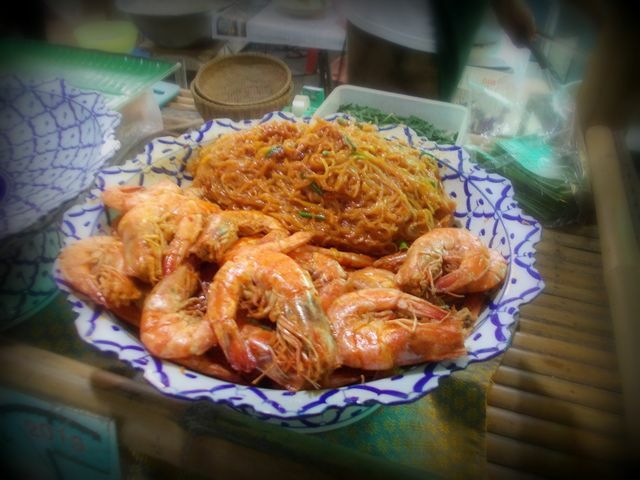 These display of good food looks very inviting, especially that prawn and glass noodles. What a nice place to visit. What an interesting place to visit!! I have heard a lot about the floating market. Must have been an amazing experience for you. What was the entire itinerary like? Nicely written. It was fun to read. 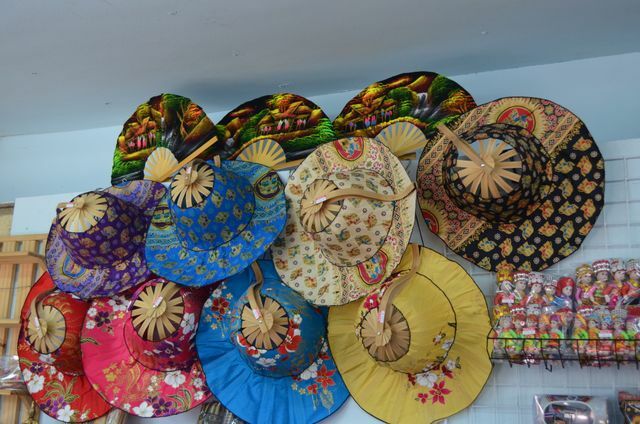 Thailand does have a lot to offer in terms of culture and diversity. Floating market looks amazing , should visit sometime soon. 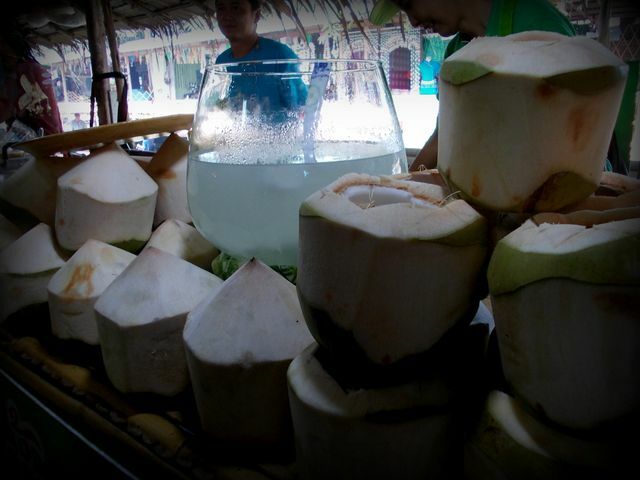 I appretiate your tips as In heading to Bangkok again and was planning to visit the floating market/s. Thanks for advice! ? I came with the links.